In this modern world and age our eyes are constantly under pressure. We spend all our days and nights staring into computer screens, mobile phones and TVs which strains our eyes and causes difficulties and eye problems. The situation worsens as we grow older and our sight gradually diminishes. So how to improve your eyesight naturally? Still, eye problems don’t necessarily have to be an inevitable process and there are a few tips and trick which can help you keep your eyes healthy and sharp. One ingredient has proven especially beneficial when it comes to vision and eye health, and we know that it has a long list of other benefits. Garlic is the most potent natural “antibiotic” which is used for everything from cold sores and sore throat to cancer treatments. It is an inevitable part of cuisines around the world for its unique scent and aroma, especially in countries like India. Wet AMD is a chronic eye disease which causes blurred vision or a blind spot in your field of vision. It’s an eye disorder which is pretty common and affects many people. Dr. Joanna Seddon from the Harvard Medical School conducted a study regarding the causes of wet AMD and discovered that a high fat diet can increase the risk of developing this disorder. Over 800 patients participated in the study, with and without wet AMD and their diet was analyzed. She discovered that higher intake of mono-saturated and poly-saturated fats, as well as higher intake of linoleic acid, commonly found in snack foods such as potato chips, French-fries, cakes, biscuits and commercially prepared pies doubles the risk of developing wet AMD. Moreover, the study revealed that the subject who ate smaller amounts of foods rich in linoleic acid but included two or more servings of fish a week had a decreased risk of developing this condition. Oily fish are rich in DHA which positively influences the blood vessels to the retina and the study concluded that DHA rich diet lowers the risk of eye-related diseases. Another study from the Tufts University in Boston, with more than 4000 subjects, revealed that food with high-glycemic values like white bread, rice and pasta increases the risk for AMD and diabetes. According to their estimates, 20% of the AMD affected patients could have prevented the condition if they had eaten less processed food. 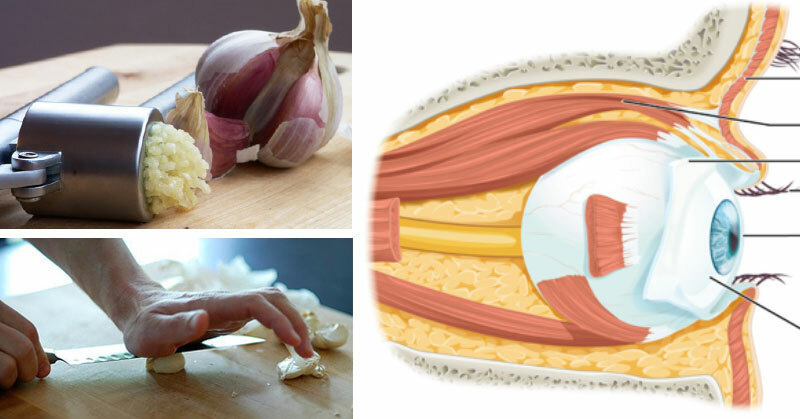 So how to improve your eyesight naturally by using garlic? In addition to its other benefits, garlic acts as an anticoagulant, which means that it has the ability to prevent blood from clotting and stop excessive bleeding after an injury. If you’re suffering from high cholesterol levels, you need to increase your garlic intake. Garlic has antioxidant properties which can lower the triglyceride and cholesterol levels significantly, up to 15%. It also protect us from arterial plaque buildup and prevents arterial clots. Garlic can also stabilize your blood pressure and normalize it. It contains a compound called allicin, which interferes with the movement of a peptide called angiotensin II which is responsible for blood vessels contraction. Contracted vessels force blood flow through a narrowed space, thus increasing your blood pressure. All in all, garlic is an extremely beneficial natural remedy against a long list of diseases including wet AMD. If you want to take advantage of its health benefits, crush or press it before consumption. This will release more of its active ingredients and optimize its effects.